“Duct Tape! How do you use it?” And so goes the advertisement promoting a household and industrial product as versatile as Vaseline and WD-40. A century-old invention, this cloth-covered adhesive gained notoriety in World War II as a quick-opening sealant for ammunition boxes And in its more than 100 years of service, Discovery Channel’s “Myth Busters” has confirmed sightings of light aircraft and the launches of canoes and sailboats held together by duct or “duck” tape. Gaffers use it to repair camera and projection hardware, and the rest of us apply a quick fix to shoes and cell phone cases. It was even used in an emergency on a lunar rover aboard Apollo 17. But, ironically, don’t use it to seal ducts as it can become brittle. And as a method of wart removal, forget about it. So much for its utilitarian value, cut tape is also been prominent in arts and crafts from the more mundane “Ductigami” of the hobbyist to the so-called “Tape Artist, “ E.S. Kleen of Hoboken, N.J. The Metro recently enjoyed the work of two artists who raised duct tape to the level of fine art. Garry Noland filled Gallery I at the Bemis Center for Contemporary Arts with sculpture and quilts made of this ubiquitous adhesive in his superior exhibit in the spring of 2013, “The Unorganized Territory.” In both a modern and classical treatment of this unusual medium, we have the more current “Rise and Fall: Monumental Duct Tape Drawings” by Joe Girandola on display during January at the Garden of the Zodiac in the Old Market Passageway. “Rise and Fall,” organized by Delaware Center for the Contemporary Arts curator Maiza Hixson, features large-scale, sculptural drawings of iconic world architecture. While the Cincinnati-based Girandola references classical Renaissance artworks in his drawings while working as a stone carver in Florence, Italy, his use of duct tape worked on two levels. 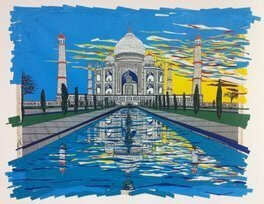 “On one hand,” Hixson says in her show statement, “employing a quick fix material to depict now crumbling artifacts (Taj Mahal, the Roman Coliseum and Stonehenge) creates a wry commentary on past and present empires.” On the other hand, Girandola’s own to be exact, the artist used duct tape to stabilize both wrists while sculpting marble. Not long after, he began to craft sculpture and drawings exclusively with an appreciation for a material versatile and adaptive enough to mend virtually anything. At least temporarily, and not without certain paradoxical consequences, past and present. Though there are no contemporary splendors in this series, the classical edifices depicted here suggest at least two possible socio-political themes: mankind has long built or branded temples, arenas and towers as monuments to himself and his values, and often on the backs and taxes of others or at the expense of larger economic issues within the community; secondly, public works are created to line private pockets while infrastructure is made on the cheap and crumbles in disrepair. All of which may be difficult to discern, let alone appreciate, so aesthetically clever and pleasing is Girandola’s work at first glance. “Clever” doesn’t really do justice to his skill at layering colorful duct tape in a manner resembling chiseled sculpture. Yet not content with traditional 2D and 3D forms, certain works experiment with postcard illustration, Pop Art, Op Art, pixelation and even pop-up art relief. Second glances and longer face time will reveal subtleties of content as well as nuances of style. But first you have to get over the feeling of walking into a travel agent’s storefront instead of a sophisticated art gallery. The ambiance is deliberately carnival, with its high energy, pure hues and reflective, flat surfaces. The work entices and seduces with its glitz and glamour and then earns our respect with its attention to details of technique and thought. Perhaps the most supportive of the exhibit’s theme of the “Rise and Fall” of civilizations, as seen in its monuments, is Girandola’s “Colosseo di Romano.” It stands, more or less, as a multi-tiered symbol to a once proud and eventually decadent society. Despite its tourist attraction reputation, its hollow remains, so to speak, are a reminder that every culture is vulnerable to invasion because of its own wretched excess, neglect and collapse. An added irony in this imposing work is that coliseums weren’t first built and then added on to honor injury and mayhem, but for entertainment, team spirit and national pride. Yet the former is subtler still as who would fault bringing water to an arid, undeveloped land? That is, perhaps, until one realizes that often with civilization comes subjugation, indoctrination and the otherwise degradation of another’s culture for the sake of empire building. The Romans conquered the world with their armies, their form of democracy, infrastructure, superior architecture, paganism, humanism and later, Judeo-Christianity—the iconic arches here could represent the latter as well—and yet, their empire fell. But the viewer is forgiven if they never got past the visually stunning, site-specific image of the Taj Mahal titled “Amore mio…ti manco?” Translated into “My love, do you miss me? “Girandola recreated this splendid monument, built as a mausoleum for the third wife of an Indian emperor, strip by duct tape strip, replete with ragged edges on the gallery’s north wall. The artist does justice to the ethereal beauty of this tomb to a doomed love in what is easily the most complex and multi-layered piece in this show. Yet even more impressive is the highly decorative reflective pool that mirrors both the Taj Mahal and the fiery sky behind all awash in a palette of shimmering primary hues. Girandola risks gilding the lily here, an interesting comment on the Emperor’s own self-indulgence, but true to the exhibit’s vision, the tattered, ragged edges of this work underscore effectively how this 7th Wonder of the World, like so many other shrines before and since, were built in the face of economic wreck and ruin. Rise and Fall: Monumental Duct Tape Drawings by Joe Girandola closes in January at the Garden of the Zodiac in the Old Market Passageway, 1042 Howard St., Omaha, NE.